Sirlin's "play to win" theory made significant impact in the meta-gaming community, but it's rejected in the wider gaming community. This theory claims that the performance of the player largely depends on his attitude, rather than his playing experience. I expanded this theory by the explanation why there are people who don't play to win: they want to pull stunts that impress real or imaginary peers who want to see sparkles and "ownage" instead of a "boring, cheap" play followed by a "you won" screen. However the above lacked experimental proof, and without it, the bad players (large majority) can keep claiming that performance is only function of gaming time, dubbed as "no life". The claim is hard to disprove because successful gamers indeed spend lot of time in games. Unsuccessful ones too, but how to catch them? I mean some can be caught by doing extremely time-consuming "achievements", while getting little progress in the main line of the game. However they are a small minority, the large masses cannot be caught playing more than the "no lifers". In absence of accurate time data, anyone can claim that he just "has life" so he doesn't play as much as the other guy. Similarly, if good play is presented, they can simply claim that the performer plays 80 hours a week. Even if someone starts a new game and book his hours, one can easily claim that his previous gaming experience helps, since games are similar. They reached an unbreakable circular argument: anyone who plays good surely plays a lot and playing a lot makes anyone good player. So I took a different approach. What if I could win while playing bad? I mean if you have "low skillz", you must be a casual. The perfect test-game was League of Legends. It's a pretty grindy (or costy) game, where you battle against other players using units called "champions". There are hundreds of them. They are purposefully unbalanced, every champion has a "counters", champions who can easily defeat it. So the only way to win is to have a large stable of champions so you can always pick one for the job. A champion costs 3-6000 game money and you get about 100-300 for a game if you play for free. Alternatively you can buy one for $15-30. So to have an "OK" collection of champions, you need to play thousands of hours or spend several thousands of USD. Add that the game is fast-paced, so you need to develop muscle-memory for each champions and memorize how to move against each enemy champion. It's easy to say that one must be a no-lifer to win here. Here I come with nothing like that: Oops, I played practically one champion. It is a "recommended" one, meant for newbies: weak but easy to handle. To add, I did not even learn the other champions. What does Katarina do? She jumps around and does damage. That's all I know of her. Even less of those who aren't often played by enemies. Add that I have zero experience in RTS games and left WoW raiding for being too fast-paced. Now being in silver league isn't a great thing. I wish to elevate at least to gold, but something very unexpected happened in EVE that will take up my gaming time. You will soon hear about that. Anyway, according to the game wiki, 68% of the players are in bronze. Despite I'm being utterly horrible in the game, I got into the top 1/3. How? Simply by playing to win, as opposed to trying to kill enemies. The unsuccessful players want to "pwn" enemies to show off their "l33t stats" to peers. I preferred farming NPCs for gold and XP, defending and attacking towers, which are the objectives of the game. Players respawn you know. Most hate I got for completing an objective at the cost of letting a teammate die. That, and helping them which is dubbed as "kill-steal". The above can be easily repeated, and having some meta-gaming knowledge, I know now that I picked a pretty bad champion as jungling needs teammates to somewhat cooperate, like be defensive when facing a stronger opponent instead of just rushing into the enemy, feeding and spamming "come gank jungler ffs". Some day I might repeat with an easier champion. The result is that someone with a play-to-win mindset outperforms other players, even if he is utterly incompetent in the game, because most players don't even try to win. A snail easily wins a running race against a rabbit which runs in circles. The bronze players don't need more champions or better reflexes as they already 10x better than me on those fields. They just need to play to win. PS: please note that there is a "normal game" mode in League of Legends, which is more fun, due to the lack of lengthy pre-battle selection (ban, pick turns, someone quit queue). So the people who picked competitive ranked games are surely attempting to win. They are just failing to. Love your blog greedy guy, but damn, I was hoping something really really awesome after your kid post, put you are saying what everyone already knows! From personal experience I highly doubt you'll climb to Gold with this attitude. Higher Silver divisions are full of people who'll see what you're trying to do (pushing) and shut you down, hard (wards, coordination, exploiting 4v5 situation to push their own objectives). Especially since Warwick is a pretty weak champion in the current meta. Good luck anyway, maybe you'll prove me wrong. Siim: You know it. Most people don't. There is a whole bronze division full of them. A very similar example can be found in Starcraft II (and original Starcraft, by extension). The only thing you need to win in earliest league is to simply be on the ball with your resource gathering and unit production. All it really takes to get as high as gold league (which i guess is kind of like LoL's silver from your description) was picking an effective build order and executing it without any time lost to lack of workers / production facilities / army supply. Getting as high as platinum requires adding another subroutine and that's sending a scout to enemy's base and learning to properly execute one or two responses to specific building compositions (or lack of thereof) that you find there. Stuff only gets demanding in diamond and onwards, when you really begin to need to be able to maintain focus at least in two places at once. Until then, in terms of getting to as high a league in as little time as possible, most players would be better off just focusing on polishing their personal skills and not worrying about being flashy or strategic or if the opponent is going to catch them off-guard. Reason being, they are not yet up against people with personal skills to pull that off. The reason people don't do it, though, is because thay don't play Starcraft to get good at it (most of the time). They play it to feel flashy or strategic or smart for catching an opponent off-guard and see no real reason to delay gratification. The thing I hate about all of this is that it's always based on the preconception that if a player doesn't play the game your way, hes playing badly, so you will always end at the same, incorrect conclusion. The majority of people play games for fun, and fun != progression. You seem to think that if progression is not being made then fun is not being had, but that's simply not true. Some of the most fun I've had in games is through failing but going down in a flaming ball of glory. @Tim: League of Legends is not a sandbox game. There is no "my way" or "your way". There is a big blue "Victory!" and a big red "Defeat!" screen at the end. There is also bronze, silver ... leagues. If you get defeats and sit in bronze, you aren't playing differently. You are sucking. You should play Dota 2. It is far more rewarding to rice creeps in Dota than it is in League, objectives are also more rewarding (doubly so for the one who gets last hit). There are also items with the sole purpose of making you pve faster and more efficiently. I would suggest you play Nature's Prophet, as he nearly always starts in the jungle and has a great impact on the game even when teammates fail to not be feeders. I would also be interested to hear your thoughts on the TF2/Dota2 cosmetic economies, should you ever gain an interest in those markets. Since you are interested in competitive games, why you haven't been interested in playing Starcraft II, which I think is the most competitive 1vs1 online RTS game? Your numbers for the percentage of players in each tier are old, they have since changed up the ranked ladder into a tier system. Bronze and Silver both have roughly the same number of players now, roughly 45% each, with Gold and higher being 10%. Being in Silver V does technically put you in the top half, but there is another issue. Under the new system, players cannot go down in tier. So the Silver V players can never be sent down to Bronze no matter how much they lose. This means Silver V players are mostly players that should be relegated to Bronze, but the system no longer allows it. Gold Division consists of the top 10% of players. I'm not going to pretend these players are all that impressive, but most of them have played a large number of games. You won't be the first farm heavy, objective pushing jungler they've faced. I will be curious to see how you do. Btw, I think you did pick the right position to win without skill. Farming in lane requires last hitting, which is something even the most skilled players don't do perfectly all the time. With jungling, you will always get all the gold from every monster in a camp. 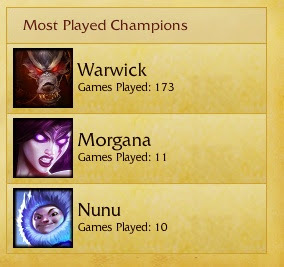 You should give Shyvana or Nunu a try at some point. They're a lot better at simply clearing the jungle (and killing objectives, in Shyvana's case) than WW is. Gevlon, your response to Tim misses his point. The point is that you do not have a metric for fun. There is no fun-o-meter, which you point at my forehead as I camp a lowsec gate in my Badger II, which registers "6", while you are trucking implants from A to B, measuring "7". As such, you have no scientific basis whatsoever to claim that you are having more fun in any game than anyone else. If there is an in-game metric which you can optimize, you can claim that you are better at that. But that is not what some (many? who knows) people are trying to do. However as there is no meter for fun, you have no right to claim that I have less fun doing what I'm doing than the other guy, unless rage is observed. So we must assume fun is equal for us. Then I have fun and in-game metric (winning), he has fun and losing. Who is better off? He is playing ranked games. They are intended to be competitive. If you wanted to just play "for fun," you could play normal unranked games. It would be like a WoW guild doing hardmode raiding and wiping repeatedly, and then claiming those wipes are just how they have fun and you can't tell them how to play. Ridiculous. They are explicitly trying to reach a goal, and failing to do so. If you are both having equal amounts of fun, then neither of you is better off directly. The game is designed to provide fun. Let just assume you are both having 6 fun. Regardless of whether you win or lose at objectives, you are still both having fun. If someone doesn't care about the team win or loss and just has fun playing the game, while you must win to have fun, you can still both equally have fun. Winning or losing is absolutely meaningless if you are equally happy to do either. In addition to this, while you are having fun, you are forcing others on your team to not have fun, so you are having fun at the expense of others, just so you can feel a personal sense of worth by winning objectives. So I would say with this in mind, someone losing objectives but having equally as much fun as you is better off, as they don't have to negatively affect someone else's game to do it. I've played competitively in counter strike and the ENSL (natural selection). While playing natural selection we get people like you, who can't follow orders as they want to do the most "efficient" thing point wise. You are the people we swiftly drop, since you are fine as a solo player but are utterly useless to the team as a whole as you are unable to work towards a common goal. do you really have fun? or do you just say so? Fun + winning vs Fun + losing. Secondly, the outcome of this equation depends on what sign you put to "winning" and "losing". Gevlon's underlying assumption is that winning is always positive. Therefore "Winning + X" is always better than just "X", and definitely better than "X + something_negative_f/ex_losing". To me, losing and winning within a virtual game largely don't matter. If i had fun and the dude that i pwned / was pwned by me had fun, it's equal in my eyes. "Losing + Fun = Fun x 2 > Winning + Fun"
@Samus Ranked or unranked doesn't matter. I play almost every game ranked as you normally get a better quality of player. There are only a few games where winning or losing even remotely matters to me however. Usually its just about the fun of playing and those "Oh my god, did you see that!" moments. Also, he's having fun by doing his own thing while his team puts in the actual work to win. All he is doing is building up himself, while completing some objectives. It's the equivalent of a raid in wow, when you get that guy that misses half of the boss battles cos hes too busy skinning and looting to fight. sure, he may make it through the raid, but at the expense of everyone else. Overall though, games are made for fun, and people should be free to do that however they want. I do find it amusing that the whole point of this ego stroking article is to prove that playtime does not mean skill, and to prove this a guy who plays games pretty much all the time and blogs about them all the time is playing a game at the lowest levels and winning and using that as proof. All this proves is that gamers quickly adapt to new games, which we know. I've not played LoL, but I've played enough games to know that I'd be able to jump into it and do pretty well against your average player. Tim, are you really arguing that you have just as much fun losing as you do winning? 99% of people would rather have fun and win than have fun and lose. In fact, for a lot people, losing is NOT fun. Uh, Tim. He said quite clearly that he plays to win, and cares only for that.. saying that he would be a bad in a team game because he would only care for the kills is exactly the opposite of what Gevlon was saying. Actually the players that are caring only for the kills and not for winning would be the bad team players! And saying that he is the only one who is lessening other players fun, is absolutely wrong! If you have never played a competitive game where you haven't gotten annoyed at scrubs in your team losing a game because of their idiocy, then I must conclude you have never played competitively, or you are a scrub yourself. "A very similar example can be found in Starcraft II (and original Starcraft, by extension)." Even getting from D to C- was no small feat and the number of foreigners in the A/B ranks was very small. Around the time of SC2 release (post beta) it seemed (based on self-reporting on TL) that D+/C- level players often ended up in Platinum or Diamond while C/C+ players reliably got into Masters. I don't know how much Sc2 leagues have improved since (successful players stay, unsuccessful players leave, less new players join -> there probably is an overall rating deflation) but the difference was quite drastic. @Tim: what you say is nonsense, unless you assume RNG always give me 4 good players who can carry me while being useless. Me advancing in the rankings by definition means that I play better than the players around me. I carry them, even if they honestly believe the opposite. "I play almost every game ranked as you normally get a better quality of player." If you don't care about winning, why do you care about the "quality of player?" Gevlon, based on rakings, you might be right. But once again you fail to realize that some people don't care about that and just play for fun. It's a concept well beyond you, as we can see. "@Tim: what you say is nonsense, unless you assume RNG always give me 4 good players who can carry me while being useless." You were placed in Bronze due to your placement results. So you most definitely didn't win a large majority of your placement games. Gevlon: "So we must assume fun is equal for us. Then I have fun and in-game metric (winning), he has fun and losing. Who is better off?" It's not a question of whether he's having more fun than you or less, it's about whether he's having more fun doing what he's doing than he would doing what you're doing. I agree that your average player at pretty much anything is terrible, and it doesn't surprise me at all that someone like you who is more than willing to put effort towards a single goal can outperform more than half the players who probably don't even have a well defined goal, just a murky 'have fun and maybe win'. I also agree that many players are failing at their goal, in that they could be much more efficient at it with a little work. However, as I allude to in the original paragraph, it can be completely rational to intentionally be less efficient at one of your goals to enhance another one. This can manifest itself as playing in a suboptimal way that's much more enjoyable, or it could manifest itself as seeking out hard opponents, thereby hurting your win/loss ratio, but gaining experience and skill, or any other number of ways. The problem arises when people fool themselves as to the tradeoff, and I think this happens often. If someone really dislikes losing, then being suboptimal in game for a small gain in fun isn't worth it to them as the cost of losing (for them) can greatly outweigh the gain of doing a more enjoyable activity. A person choosing to play suboptimally in this situation is acting irrationally, and I've seen many people do it. "Uh, Tim. He said quite clearly that he plays to win, and cares only for that.. saying that he would be a bad in a team game because he would only care for the kills is exactly the opposite of what Gevlon was saying. Actually the players that are caring only for the kills and not for winning would be the bad team players!" Except it's a PVP game, and sitting in your base gathering gold and XP is not helping the team, it's helping yourself. Watch the professional matches and see if they have a guy sit behind doing his own thing all game. Doesn't happen. If the other players weren't fighting the opposite team, Gevlon would simply get crushed. His team is holding him up and pulling him through matches. There's no way he would survive the higher ranks. The whole point of his article is that he can be a good player (as in skill) despite not having much playtime, but that's not the case. He can grind NPCs in a PVP game while his team handles the PVP. How is that being good at the game? If playtime had nothing to do with it, he would have been placed in silver to start with and wouldn't have had to do so many games to get there. The problem is Gevlon doesn't seem to understand anything in games beyond his single unit of measurement. In this case, he take progression to Silver V as proof that he's good at the game. In EVE he measures ISK in his pocket and his AFK miner killcount. Games don't run on the single metrics he picked. Most of them have complex mechanics that give you multiple ways to measure progress, but apparently since Gevlon doesn't think any other metrics matter, that's it, they don't. Don't forget guys, he's a rational and we are all just morons and slackers. We have no ability to even conceive of his greatness, and he will change the world and make it better for our children. I think I understand you better, you want to "win" and "winning" your way is fun for you. Take your look at eve: you want the most kills "gank" stuff in high sec, want most isk 'monopolise a market segment". Thats your fun. It is not however universal fun for everyone. some like the idea of only pvp, or pve, or mining, or industry for thier own fun level. Thats why folks give you a hard time, you keep trying to show them how to "win" your way and have "fun" your way. no one likes that person sorry. If you get defeats and sit in bronze, you aren't playing differently. You are sucking. Only if you believe you should be in some higher tier. None of us are earning Bill Gates' level of money, so by that metric we are all "losing the game" or "sucking." But who would use that sort of metric of success? Goals are arbitrary. If you set yours lower, you can still achieve (what would be for you) success. It will be less success than other people, maybe a lot of other people, but who cares? Caring about what other people think of you is social ape routines, right? And this is besides the fact that it is quite possible to have fun even while losing. Fun is a subjective emotion. It's even possible to not have fun when winning. So we must assume fun is equal for us. We could turn that around to suggest no fun is being had unless joy is observed. I mean, if I'm having fun on the AB bridge and I see you possibly AFK guarding LM, there is no way to convince me that we are having equal amounts of fun - especially considering your fun comes from winning, which hasn't occurred yet. Even if our fun counts as the same magnitude, I spent more time in that fun state, with less exposure to negative outcomes (if we lost that AB game, I still had fun and you didn't). First I want to point out that I agree that playing good does not directly correlate with time played though most people who WANT and TRY to improve will improve in time. I will also give as an example the fact that some of the oldest pro teams in LoL are not constantly dominating (as they should if time invested = skill since some of their players have been playing since beta). Secondly, champions may or may not be purposely unbalanced though there is a cycle of FotM champions that get nerfed after which others raise to FotM status. Also the "counters" in LoL are much softer than in DotA2 and picks don't outright win the lane for you. The actual general consensus is that you should play a champ that you can play rather than one you are not really good at just to counterpick. If you are better than your opponent you can usually outplay them though this gets harder at higher levels of play due to people having more general knowledge of how offensive/defensive they should play. Third OWNING a large pool of champions means nothing if you can't play them properly. More champions does not help you win more. You are better off being good at 1-2 champs in a few roles. You don't need a lot of champs to go up the ranks just a few generally good ones that don't have niche roles or rely on certain team comps to work. Last but not least Silver 5 doesn't mean anything. As others have mentioned the distribution between bronze and silver is almost equal and where most players are situated. If you really want to prove your point try to see how many games does it take you to get to mid gold (Gold 3). I don't think Gevlon cares so much about winning as figuring out HOW to win. For example if the way to win the game was to develop muscle memory and practice that a thousand times until he could beat people at that he'd be a lot less pleased than if he could figure out a technique for winning that didn't depend on personal skill. Of course doing that is rather harder than just winning a few games. I must say i agree with Gevlon, the average player in bronze is not trying to win, its trying to "wtfpwn op nerf wahhhh". Also @Tim, play normal and saty away from ranked, your attitude is the reason why so many competitive games get thrown. IE. "who cares brah.. its just a game, chill", and indeed its a game, but if you just want to kill time, play normal or ARAM, or domininon. Leave rank for those that actually want to win, or get in the right mindframe. Else you are wasting my time and my fun. Though i find more offensive that you imply with your comments that your time is more precious than mine. @Mmrdkm Don't get me wrong, I want to win and I aim to win. I just have fun playing regardless of the outcome. I'm not one of those people that is instantly sad because the overall outcome of the game is not what I hoped. Just because historically I've played competitively in leagues, I've become accustomed to a certain quality of player that you generally don't find outside of ranked games. I like players that have a sense of team play and work towards a common goal. I agree with Gevlon, the average bronze player wants to "wrfpwn" and wants his killz, objectives are secondary to his own sense of awesomeness. I've ersonally carried many games, accomplished the objectives and gotten reported cause "im a noob" and "u took my kills". @ Tim, go play normal, your attitude is not appropiate for a competitive enviroment, and i find offensive you seem to think your time is worth more than other peoples, since you seem just as likely to throw a game cause "gg, im feeding, surrender, its just a game" kinda attitude. @Mmrdkm but he isn't outperforming. HE made it to silver V which is worth absolutely nothing. You can passively get there just be being in a team with 1 half awake person. He stats in his articles that he spends all of his time farming for gold while his teammates fight. what's worse is he thinks the objectives are to kill the monsters, when they are merely there for a boost if you get put under too much pressure to proceed. I'd be shocked if he doesn't get voted down for bad playing after every single game. How can that possibly be seen as being better than the average player? I don't know if you've played LOT but the objective is to push to the enemy base, destroying their towers, then destroying their nexus. There are sections on each side that give you the ability to kill NPCS that give you gold and a couple of NPCs that give your team gold. The problem is, when you've got 1 person playing like Gevlon does, it means you are 1 person down on the front, which means its harder to push forward. What he is doing has NOTHING to do with the game objectives. The reason his team abuse him over chat is because he is playing badly. I'm guessing that his silver V is because he just entered the ability to play ranked games and his placement placed him there. To even be considered as "ok at the game" he should have got silver III. Silver III you can get to with a 1:1 kill:loss ratio. @Tim: 2/3 of the players are in bronze. So anyone in silver is above average. Your opinion of good play is irrelevant. Mine too. Results matter. According to the game I'm a better player than everyone in bronze, period. @ Tim, i'm sorry, but, what article were you reading? cause man you missed the point... i suggest read the post again, or take a reading comprehension class. heres a tldr for you, gevlon starts in bronze, gevlon doest indulge in "wtfpwn", gevlon farms gold, gevlon uses gold to become the carry, gevlon pushes objectives, gevlon wins the match while everyone else has l33t skills and wtfpwn the other team. @Gevlon That's your opinion that you are a better player. You state it likes its fact. I'm not surprised that 2/3 of players are in bronze, because everyone that plays for a short while then stops and everyone that quits eventually ends up in bronze. Ask anyone that actually plays though, Silver V is NOT the definition of a good player. This is just ANOTHER example of where you decide the metric for deciding the outcome of your "experiment". If you control the metrics, then you control the outcome of your experiment. @Anonymous the aim of the game is not to kill he NPCs and farm personal gold. The aim is to defeat the other team. While Gevlon is messing around with the NPCs, the rest of the team has to push on the objectives 4v5. Even Gevlon himself states they are telling him hes a noob and to come join them and such. There really isn't that big a section of the player base that aims for killcounts in LoL. Since it means absolutely nothing outside of individual matches, most people focus on objectives. The objective are PvP though, so if you are actively avoiding the PvP element of the game, you are actively avoiding objectives. You know nothing about how the rest of the players play except what Gevlon says, so you are judging that Gevlon is the guy that makes the match while everyone else is failing. I'm basing what I'm saying on fact, and the fact is, that if he wasn't playing at a barely passable level he should be in at least Silver III. You only get to Silver V through inactivity or being really bad. This whole article is just another attempt for Gevlon to express superiority, and it fails at that. Again. You seem to be ignoring the gentlemen who pointed out that your numbers are incorrect. 2/3 are in silver/bronze now, they have nearly identical numbers. You are in fact right in the middle With most players. I expect you will ignore this.